Do you seek Gallons of Glory? Enter Krosmaster: Arena, a miniatures game that brings fast-paced arena-style battles in the “Krosmoz” to your table top. Yes, this is the Krosmoz, where bored Demon lords sit around and toy with not-so-immortal beings and make them face each other in battles on amazing landscapes! You as the player control your not-so-immortal, but still very cool “Krosmasters,” the very best warriors of the Krosmoz. Each turn you move and cast spells in an attempt to capture your opponent’s Gallons of Glory (GGs). Run out of GGs and the Demon lords laugh, then push the reset button. In the midst of all this omnipotence, Krosmaster characters can collect Kama, and buy upgrades and use their innate special powers to defeat and demoralize their opponents – giving the feel of an arena battle video game. Welcome to the Krosmoz! Note: The first time you set up the game, some assembly is required. But once assembled, the components store nicely in the box. Set up for the first game will be a bit longer. Set the game board on the table, choosing either the “Elemental” or “Pit Arena” environment. Each different arena offers a different layout for scenery in the upcoming battle. Speaking of scenery, place the assembled Trees, Bushes and Crates on each of their corresponding cells, Then place the Kama tokens on every cell that has the Kama icons on them as well as on each Demon cell. Place the rest of the Kama tokens aside. Demonic Reward Tokens are then sorted by cost and divided into two piles face down. The top tile is them flipped over and placed in front of each stack. Now you get to assemble your Krosmasters! Using the game cards, assembling your team of Krosmasters can be done either by simple choosing them one at a time, choosing them randomly, or by draft. Once the Krosmasters are chosen, take each card, and place them from left to right in front of you in order of their initiative score. (That’s the small number in the lightning bolt on the upper left of the card). This creates your “Timeline” and the order in which your Krosmasters will act on your turn. Now take each Krosmaster figurine and place them within the starting area, usually within the last two rows of cells closest to you on the game board. Give each player six Gallons of Glory tokens and place one GG token to the side of the game board.. This is the “Wild GG” and we’ll talk about that in a bit. With the Demon Lords satisfied with the setup of the arena and the Krosmoz in line, you may begin the battle! Press Start! Goal: The first player to lose all of their Gallons of Glory, or have all their Krosmasters knocked out must hang their head in shame in front of the Demons of the Hours and Minutes. There are three major phases in a game turn, and each player must complete these phases in order before play passes to the opponent. They are the Start of Turn, Character Turn and End of Turn. The tension rises! The first player rolls two dice. If the result shows any two matching symbols, the Demons of Hours and Minutes get impatient, and take one GG from each player. If however the symbols do not match, you can use these symbols to give your Krosmasters “inspiration!” Each specific symbol provides a unique power and can be placed on any Krosmaster you have in front of you. The Explosion icon, for example grants a one-turn Critical Hit power for that character. The Shield symbol grants the Armor Power, and so forth. Just put the die on the character card to remember. If you don’t want to grant your Krosmasters inspiration, (sheesh!) you can collect Kama from the bank. Simply trade in one die for 1 Kama, or both dice for 3 Kama. Kama is good, you’ll see why soon. Your Krosmasters each have several key attributes: Movement Points,(MP), Action Points (AP), Hit Points (HP) as well as Spells and Powers. During this phase, you will move and take actions using the MP and APs respectively with each of your Krosmasters in the order of your Timeline. When the APs and MPs of one Krosmaster are used up, or you don’t want to use any more, that Krosmaster is done and you may then activate the next Krosmaster in your Timeline and so on. But what do you use these Movement and Action points for? Move: You may move your Krosmaster one cell for one MP. You can’t move through scenery like trees, bushes and other Krosmasters (even your own) You can however hop up onto crates! If you want to move away from an adjacent enemy however, you may be “Locked!.” Both players roll dice. If the Opposing player rolls a “Magnet” icon, then you have to roll at least one if not more “Boot” icons to be able to move. If unsuccessful you have to stay where you are. To have your Krosmasters cast spells or take other actions, you have to spend Acton Points. Casting a Spell: Most of the time, Krosmasters use spells to attack their opponents. Each Attack Spell has a Cost, a Range, Damage, (which is color coded associated with four different elements) and perhaps an additional effect. But there are also Healing spells, Summoning spells, and Special spells that do all sort of cool things. When using an Attack spell, you must pay the AP cost, apply any effects, and check line of site if it’s a ranged spell, then roll a die. Most attack spells have a damage value listed, and any “explosion” icon rolled adds to that damage. But hold on a minute! Your opponent gets a chance to defend themselves. They roll one die and any “Shield” results rolled will prevent that much damage. If any damage occurs, Injury markers are placed on the Krosmaster’s card and life goes on. Unless of course the Injury markers equal or exceed the targeted Krosmasters HP. In that case, the Krosmaster is removed from the board and you collect GG from your opponent equal to the defeated Krosmaster’s level. Picking up Kama: Little Kama tokens are placed all over the board and picking them up costs AP. If one of your Krosmasters is on a cell with some Kama on it, pay one AP for each Kama you want to pick up. Then place them in front of you. But what will that get you? Buying Rewards: Ah, what’s a battle without Rewards? In this case Boosts, Buffs and Equipment. If you maneuver your Krosmaster to a Demon cell, you can spend one AP and pay Kama to buy a Demonic Reward. There are Granite Rewards which cost 3 Kama, Jade Rewards which cost 6 Kama, and Jade Rewards which are very cool and cost 12 Kama. Since there are revealed Rewards and face down stacks, you can purchase the visible Reward, or draw from the top and try to get just the Boost, Buff or Equipment you are looking for. Once purchased, the Reward is placed face down on the Krosmaster card of your choice. The Reward can be activated at any time during your activation phase. Once turned face, up the Reward will have a specific effect based on what type of reward it is. Boosts provide an immediate effect and then are removed from the game. These include bonuses to damage, potions that grant unique abilities and some cool fighting styles. Buffs when activated, grant a temporary improvement to your Krosmaster until the start of your next turn. These include resistances to certain damage types and more styles that grant unique affects during battle. Equipment is a permanent improvement that once activated stays on that Krosmaster card until they are defeated. There are four types of Equipment Rewards: Weapons, which grant the Krosmaster a new Spell, Sets, that grant new Powers, Pets that improve characteristics and Dofus, which are the most effective and powerful rewards of all. After all of your Krosmasters have completed their Activation Phase, that’s it! Prepare to defend yourself against your opponent. It’s now their turn! So all of this running around and casting Spells, Boosting and Buffing happens until you or your opponent’s Krosmaster either lay defeated on the Arena floor, or one of you has lost all your Gallons of Glory. Game Over. It is immediately clear that no expense was spared to produce this beautiful game. Kudos to Alexandre Papet, Edouard Guiton, and their entire 2-D and 3-D teams for the work on the art, graphics and truly amazing miniatures included in this game. Everything stores in the box after assembly. One minor note is the crates will have to be secured with glue or tape. But other than that, the production values from top to bottom are off the chart. It’s just a feast for the eyes. Easy. But wait, isn’t that a 32 page rulebook I see? That’s because the rule book includes 7 tutorial games that walk through every nuance of the game, and actually include reduced sized game boards printed on the tutorial pages so you can play as you learn. After these and some reference pages, the actual rules are only 5 pages long. On the back of the rulebook is a gameplay summary that is all you will need once you have played once or twice. Everything is on the cards, so very little reference is needed. Absolutely accessible to families especially ones with children who enjoy video games. There is very little “real” violence and no questionable imagery. The use of the word “Demon” may give some parents pause. But its use is only to mean “powerful other world being. There is nothing inherently demonic in the game. Being a 2-4 player game takes this out of the realm of social or party game. There are few random elements on the gameplay. Well, one actually and that’s the dice rolling and it’s integral to defeating your opponents./ However everything else is maximizing Krosmasters’ abilities and powers. Movement and use of APs can be very strategic. Yes for the light strategic gamer. Games last only around 45 minutes to an hour, and can be set up an put away quickly and easily. Not a heavy investment of time or brain cells. The base game is pricey so you may want to go in on it with a friend or play someone else’s copy. Gamers who can easily identify with videogame-like mechanics will be in heaven. Gameplay is streamlined and is also expandable with over 40 Krosmaster minis (“Gotta have em all?”) Avid gamers must try it. There are tournaments being planned for the game, with exclusive promo minis and if so, this could lead to a very powerful presence among Power Gamers. A definite maybe. What fun! Everything about this game beckons you to play. The first thing any gamer will notice, and perhaps the reason for its success on Kickstarter, is the quality of the miniatures. They have expression and movement, are cute, goofy and sometimes freaky. They are a pleasure to play with. This style and “shelf appeal” may not be your cup of tea. Every game, no matter the style, must be rated first for the experience they provide: starting with gameplay. The base combat mechanics of the game are simple. So simple in fact that at times, they may be a bit repetitive. The game employs a familiar combat mechanic that is common in many games these days: The attacker rolls to hit, the defender rolls to block, the difference is the damage taken. Combat is then augmented by the use of the 3-D environment, line of sight, ranged attacks, Powers, and the special effects the spell may have in addition to damage. Perhaps the most unique aspect is the chance to upgrade your Krosmaster mid game. Using Kama to buy Boosts, Buffs and Equipment, placing them face down and revealing them when needed provides a great variable to the combat system. And there are a wide range of these Rewards. But you cannot simply invest your Kama in upgrades thanks to the unique victory conditions of the game. You may also spend Kama during the game to buy Gallons of Glory. The first GG bought is taken from the one “wild” GG set aside at setup. However, thereafter, when bought, GGs are taken from your opponent. This feels like a financial victory, essentially buying the game out from under your opponent. And it’s this balance and decision process that makes the game strategically deeper. The tactical variables do indeed ramp up when the various special abilities and powers of the Krosmasters themselves are figured in. The interaction of all these elements, give the game experience innumerable variations; especially with the over 40 different Krosmasters that can be acquired to expand the experience. Slather on a thick and colorful layer of theme and you have the complete package: a well thought out, well made, light game experience that is deceptively simple and ultimately enjoyable. Krosmaster: Arena succeeds on many levels. It’s a good game for adults, but it’s clear that this game excels as a game to share with children or for children. Although the game is recommended for ages 14 and up, it is suitable for children ages 10 and up. It’s very accessible and taps into the familiar “battle” tactical games common in many handheld and console games old and new. But this doesn’t work against the board game. It actually enhances its enjoyment though familiarity. When you play, you get the feeling that this game has a chance to explode into something huge, like some famous Japanese collectible games of the past 15 years. With the current boom in board gamesas a family activity, you can’t help but wonder if the folks at Japanime Games and Ankama have stumbled onto something. All conjecture aside however, you will have a great time playing and collecting Krosmaster: Arena. Welcome to the Krosmoz. The Demons of the Hours and Minutes have finally found a hobby worthy of their cruel hearts... the Arena! The idea is simple. They select (read: abduct) warriors from across many lands and ages and whisk them away to the Arena, where the enslaved gladiators must fight for their souls and the chance to become the ultimate champion. Working with Ankama, we are excited to bring the worlds of Dofus and Wakfu to your tabletop. Welcome to Krosmaster: Arena. Krosmaster: Arena is a Player-vs-Player oriented board game that offers the craftiest tacticians among you the chance to challenge other players in heated battle. All players build their team using a pre-deterimined method, either a point system, draft, or at random. Utilize your team's various talents and abilities to create a powerful fighting force. Every figure has a point value attached to it to help balance things out. Only those who are able to create a strong, yet versatile, strategy will prevail! I find it particularly hard to apply a rating to Krosmaster: Arena. On the one hand, it is as fun to play as any game I’ve encountered… on the other, I paid an insane amount of money for that experience. If I hadn’t spent so much – and many sane-minded people wouldn’t – the game would be nowhere near as fun, strategic or re-playable. Those are pretty important qualities to sacrifice in keeping total cost reasonable. More on the value of the “extras” appears at the end, as well as in the discussion item I posted a few months ago. There are sheets upon sheets of cardboard bits to punch and assemble (yes, assemble… trees, bushes and crates have to be put together; the crates need to be glued to stay assembled) when you first open the box, and the rulebook – while quite thorough owing to the playable tutorials mentioned in this site’s review – takes an eternity to get through. First go through, you’ll take an hour or two to get the board ready to play… but you won’t be touching that board for 5+ hours as you play through the learning tutorials. While I do like the idea of playable tutorials (particularly to make the tedious task of learning a complex new game fun), I absolutely hated it here. They’re way too slow in introducing new mechanics, and they are no fun at all. The early tutorials take around 10 minutes to complete, but the later ones can take an hour. Once you’ve graduated to the game proper, setting up the board’s bits and pieces can be accomplished in around 10 minutes… but once the game is expanded you’ll want to introduce a drafting mechanic, and drafting can take a half hour alone, depending on how quickly your group can make decisions that affect the entire game. My typical open-the-box to first-move time is around 40 minutes, which eclipses even Arkham Horror for tops in my collection. Game play time varies WILDLY… I’ve had 30-minute blowouts, and 2+ hour strategic standoffs. I really like this about the game, but when you combine this with set-up and draft time, it can make it so that Krosmaster: Arena can only be considered when you’ve got 3+ hours to play (and there’s always the possibility you’ll find yourself done in a little over an hour). Learning curve is quite steep on Krosmaster: Arena (you couldn’t have suspected otherwise with all the mention of playable tutorials, could you?). If you completely throw out the tutorials and learn the game from just reading the rules, it will still take a few hours (and much rulebook citing) to hammer down movement and action mechanics as well as the common character powers. But that’s just the start… this is a game where the player with the superior strategy ALWAYS wins… and to be that player, you need to put a lot of time and concentration into the game. Note that there are dice, but they really only serve to speed up or slow down the game, and I’ve never seen them play a role in the outcome. Once you reach 20 or so hours of game time, nobody with under 5 hours will be able to beat you (when I’m playing against first-timers I purposely put together the weakest teams possible… but still end up winning). Paradoxically, it’s only once you’ve reached 20+ hours of play time that you’re going to be able to teach the game to a newcomer reasonably swiftly (and accurately) – I can teach it to somebody in around 30 minutes, which is a huge improvement from learning via rulebook. My suggestion would be to learn the game at the same time, and at the same speed, as a friend or 2 that will be your primary opponents… this way, everybody stays invigorated and there’s no heavy favorite. The theme is super-cute, the miniatures are remarkable and the gameplay is incredibly smooth and polished… but this game will only appeal to tactical gamers. I only have one person in my group who loves tactical games, so 90% of my Krosmastering comes against her. I love tactical games but hate war games, so this is a rare treat for me (hence my willingness (stupidity?) to dump so much cash into it). This is NOT a game night game unless you have 3 or 4 copies and you’re running a tournament… this is a game to play when you’re with one other person (or 2 or 3 for team play) and you’ve got some brain cells to burn. The non-tactical gamers I’ve played this with have no desire to play it again. There is a miniature in the base game that clearly has blood dripping off her hands, and she’s depicted on the box art howling at the sky with said blood prominently displayed. Other characters in the expansions who share her mold (yes, miniature molds are refinished and repainted up to 3 times) have some blood effect as well. It’s kind of hard to call the violence “implied” when it’s so in-your-face. Whether graphic or not, the game is far too complicated for youngsters anyway. I would think that 13- or 14-years-old would be the earliest a child could get into it. One cute note: due to the adorable miniatures, this WILL become a target of attention for the youngest of children. My 17-month-old saw me fiddling with the miniatures several weeks ago and had to have one, so I let him play with a duplicate Oscar Kass that I had (these things are far too fragile for a toddler, so don’t let them handle one unless you have a duplicate). I told him his name was Oscar, and now my son screams “OSCAR!” every time he sees him. In fact, he calls ALL small action figures Oscar now. So Krosmaster: Arena produced one of my son’s first 20 words. Krosmaster: Arena is a new, novel twist on tactical games… but it is soundly a tactical game. It bears more in common with Summoner Wars, Heroscape and Chess than it does any game with a similar theme. One game comes quite close to Krosmaster: Arena in theme – Super Dungeon Explore – but it’s a dungeon exploration game with little else in common. 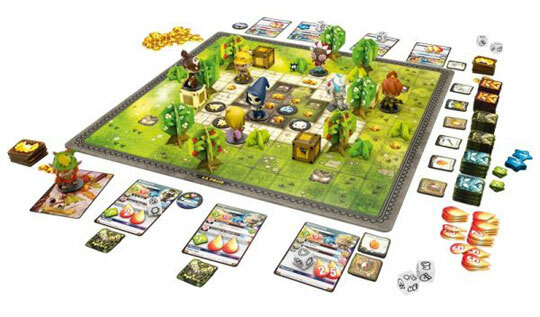 That changes this summer when Season 2 of the Krosmaster board game world – titled Krosmaster: Quest – comes out. It is a dungeon exploration game that should feel a lot like Super Dungeon Explore. I can tell you that Krosmaster: Arena has made it into my nearly-impossible-to-crack top 4 favorite games to play, and I’m sure it will be staying there. In fact, right now it’s #1 (although time will surely drop it 1 or 2… you can’t keep Sentinels of the Multiverse down for long). It is a perfect 10 game in my books. But that experience did not come from the base game you can buy for $60. All-told, I’ve spent over $850 to build this “perfect” game… and for me, every penny of it was necessary. First comes the resin terrain and summons… you can pick this up during a Kickstarter campaign (2 Krosmaster Kickstarters in the last 9 months, with another one on the way in May) or email Japanime Games – they’re willing to sell many of the promotional items directly to consumers (when they have them in stock), but won’t release them to retailers. Either way, it’s expensive. Japanime sells these for $125; when they’re out of stock they can go for $200 per set on eBay. There are 36 items in the set, including replacements for ALL cardboard parts from the retail game. This is not optional to me – the trees, crates and bushes look so much better than the cardboard versions (the cardboard looks awesome by the way… that’s how great the resins are), and the base game really suffers from summoned creatures being small cardboard pieces so this fixes the problem (it’s much better to put out a Tofu or Gobball miniature when summoned than a flat piece of cardboard on an otherwise 3D board). Next comes the less-important game enhancements: real metal coins (two types in the game – small “Kama” and large “Gallons of Glory”) to replace the cardboard versions; colored, translucent etched dice to replace the black-and-white painted dice (these are in different colors so that each team’s dice can be easily identified); and much larger character cards. While not as expensive as the resins, these aren’t free – you can grab them from Japanime Games when in stock for around $50; possibly double on eBay when out. I call these upgraded parts “less-important” simply because they are not imperative… but they still boost the game significantly. No more squinting to read small text on your character’s spells, and the upgraded dice are my favorite custom dice save Seasons. Lastly… most importantly… most expensively… you need to get the rest of the characters. The base game carries only 8 of the 42 available Season 1 characters. All 42 of these babies are drastically different and change the game to suit their attributes, but if you use the same 8 each game (and you’ll have to if you only have the base set) your games will change only subtly due to team configuration. This gets old very quickly. Of the 34 non-base characters, 26 are easy-to-get (not to be read “cheap”)… they are available in 8 expansion packs you can find at Amazon, your favorite online store or possibly your FLGS for $20 to $25 apiece (4 characters per expansion, so $5-$6 per character). My advice: do not buy Krosmaster: Arena if you don’t plan on picking up at least 3 or 4 of these. The last 8 Season 1 characters are promotional characters… unlike other promo items, Japanime Games does not sell these. Instead, they give them away at conventions, tournaments, or (most conveniently) during Kickstarter campaigns. Buying these on eBay is not advised; some are available for $10, but others go for $70+. The promo characters are not as important as the proper expansions. If you are a tactical board game lover just dying to dump $250 minimum into a new game, you will not find a better way to spend your money than Krosmaster: Arena. If you’re not that very specific person, grabbing the base game will just tease you or leave you unfulfilled after a few dozen games. I happen to be the former, and I couldn’t be happier. But I have to knock what would have been a perfect “10” score down a point because of how restrictive the cost makes the game. In the OtherWorld, the Demons of Hours and Minutes are so bored that they use a magic ritual to lure the best Krosmaster warriors and make them fight in the arena for their own amusement. You are leading a team of 4 Krosmaster warriors in a battle where your tactical skills is the only path to victory. Age: 10+, my 11yo daughter didn’t have any problems learning the game. The 3D environment is a cool touch. It’s pretty fun to hide and move around the trees and bushes. The only negative point are the boxes. They don’t assemble well and keep falling apart. You will have no choice but gluing them and depending of your skills the the results can be a disaster and when you pay a good price for a game you expect more…but the miniatures makes you forget everything. All the other components are made of great quality. The game is easy to learn and teach. The mechanics are simple and standard. But still reading the rulebook and playing a learning game took us 2 hours. But after that we feel very comfortable with the game. The difficulty of the game lies on the fact that each character have 2 unique attack possibility and special powers for critical hits, armour, tackle, dodge. With a total of 8 attack possibility it can be intimidating at first but after a few games you will find that Krosmaster. is not a difficult game at all. Also, it can be difficult to win against a more experience player. What makes you want to replay a game is how fun it is to play it and this one is fun, a lot of fun. At the beginning of a player turn, roll 2 dice and choose to give the dice power to 1 or 2 character or sell the dice for Karma (gold). The power can give you 1 more a dice when rolling for critical hits, defence, tackle or dodge. The player plays his 4 character 1 after the other according to the Timeline (initiative value on the character card). The character can move according to his movement points (MP), cast a spell to attack an opponent, grab a Kama, buy a GG or buy a special power. Each character has his own number of Movement Point (MP) and Action point (AP) to use. When it is done it’s the turn of the other player and you repeat until the victory. The first time my daughter saw the game she felt in love with the miniatures and wanted to get the game. I have to admit that the game is very appealing. At first I was not sure because we don’t usually play fighting or tactical game so we took time to watch game play videos in order to make our mind. We are so glad that we got this one, it’s a nice addition to our gaming shelf. It is the only game of that kind that we have and we are not looking for another one. It is our new best daughter/father game and we play it on a regular basis. It is easy and fast to play. If you like this game you will also want to add more characters so be prepared to fall for the Krosmaster miniatures addiction. I discovered Krosmaster Arena during the Frigost Expansion Kickstarter and had to ask myself how I could have missed the original game. Krosmaster Arena appealed to me with its chibi miniatures and quality artwork. The game looked adorable, and because I’m a sucker for the cute factor, I can be taken in by a pretty exterior only to find the game inside the box is lacking. However, such was not the case with Krosmaster Arena. Each player controls a team of characters (or Krosmasters) and is battling your opponent’s team of characters (Krosmasters) for the Krosmoz Demon lords entertainment and you are attempting to either knock out your opponent’s team or have them lose all their Gallons of Glory Tokens. You roll dice to do battle with your opponent and your Krosmasters can use special powers (or special assistants), which will be indicated on their character card. You can buy rewards with Kama you acquire, which will help your Krosmaster as well. The board game has obstacles to move around and even climb over, which factors into fighting and moving as well. 1.Miniatures: I really liked how well done the miniatures were for this game. And they all are painted and ready to play right out of the box, so there isn’t any delay to play while you prime and paint your figures. The figures are all very creative looking and in general, there are a number of unique sculpts with very creative looks, although at a certain point, the same figure gets reused and just given different colors to be dubbed a new character. Although for me, this isn’t a problem as the figures all still have very different looks and the quality is very high. 2. Good game: There is a solid game here. I was taken in by the figures and I wouldn’t have expected to like a tactical, fighting board game, but it really works. It is easy to learn with a nice tutorial rulebook, and it is fun to play. 1. Cost for the game can add up very quickly. It is good to get more Krosmasters, so you can add variety to your games. But this can get expensive. You can get a deal if you are patient and are willing to shop around, but even so, if you are wanting to upgrade your game, you can easily drop a good chunk of change into it. This is a fun game that looks good on the outside, but has surprising depth inside. My sister gave me this game as my last Birthday present, and i really enjoy it. I am specially charmed by games with good visual aspect, and this one is gorgeous. I take a pair of the minis in my hands and feel like a child once again. Said that, behind this incredible art, a deep strategy game is found. Like other miniature games, you have to join a team, but not of dozens of units: just a few expert warriors. This is done quite quick and easy, but do not think it does not matter, it is where the first important decisions will appear! The game is up for organized competition. You really like it and want to enter in a league? With your copy of the game a code for entering the online version will be given to you. It is as you will expect a good implementation of the game, but be sure to play some physical games firts, cause the automatizacion of the mechanics will not be so clear for you if you are not used to the game. Online you will have available the same guys you have a physical miniature, using the codes you always get when purchasing them. I can value good collectible games, but sorry i will not buy anithing blindfolded. So, in Krosmaster you will buy the miniatures you will like to add to your collection in packs, knowing what you are getting. Also you can check on their web site all the stats related to each mini before buying it, so this is perfectly controlled. Do not be afraid, spanish colleagues. I recommend to buy online or on local stores that are enough reasonable to understand that the spanish edition has killed the collectible aspect of the bame, the english edition packs. The mechanics of the game are very well understood on the icons of the cards for each character, and you will need to understand the special abilities which anyway come from a list of the rules in the basic game. Krosmaster Arena is all about the miniatures and simple gameplay. It’s your typical battle game with just enough tactical for casual players like me. After building your team of 4 Krosmasters the first player activates his character one after another to move and / or to spend actions point to cast spells, buy special powers and grab coins. You start the game with 6 Gallons of Glory (GG) and the objective is to remove the other players GG by knocking out his character or stealing his GG for 10 gold. The last one standing with GG’s is the winner. I mainly play with my 9 yo and my wife. I can see this game being fun if I had a regular group of people that were avid gamers to play with. The quality of this game is amazing. The paint on the “miniatures” is great. I say miniatures in quotes because they are not standard size. The terrain pieces are also very nice thick stock cardboard. My only complaint about the quality is that the terrain pieces get knocked over/moved often. The rules are not too difficult but there is a lot to learn. I ran into a few problems from the get go. Some of the tokens are either mislabeled or the translations went wrong. Some rules are not very well explained, but that is true of a lot of games. Overall; the quality is great. The game has potential to be fun. This is one of those games that you can spend a fair amount of money on, however it’s worth every penny you’ve spent. I’ve played Final Fantasy Tactics all my life, and this game gives you the same experience only on the table top. I had seen a youtube video about Krosmaster: Arena and once I was done watching I knew I was hooked. The starting game is roughly $90CDN, but you get 8 characters, all the terrain, a double sided game board, all of the tokens and dice. It’s a steal of a deal compared to some miniatures games out there. The rules can be a bit tricky to pick up but it only takes a couple of games to figure it out, or you can do the step by step missions in the rule book that will teach you all of the basics of the game. The game take about 10minutes to set up when you first crack the box, as you have to punch out all the tokens, trees, hedge and creates. The game is a turn based game, where one player activates all of his characters one at a time, completing actions and moves based of the printed cards (that come in the game box) Once a player has completed all of his moving and actions he/she moves onto the next fast character in their team, this continues until they have activated everyone on their side. The second player continues to do the same until the game is over. You’re able to play the game with 2-4 players with the main box, the expansions allow you to bring some new characters into the mix. If you know someone who has this game I would suggest you try it out. 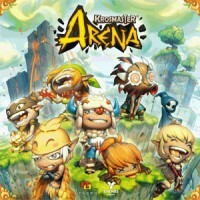 Add a Review for "Krosmaster: Arena"